AIRIS Hyperspectral Imaging | PSI - Physical Sciences Inc. The Adaptive Infrared Imaging Spectroradiometer (AIRIS) technology was initially developed under Missile Defense Agency (now BMDO) and Department of Energy SBIR funding. It was intended to address the joint missions of hyperspectral missile plume detection in the 3 to 5 µm wavelength region (MWIR) and the detection of toxic industrial chemicals from nuclear processing activities in the 8 to 12 µm wavelength range (LWIR). Operation in the MWIR was initially demonstrated in 1995. In 2001 the technology was successfully employed to locate the Mach Disk and downstream compression shocks in the second stage of a SCUD II missile on a test stand. This measurement technology provided capability to the United Nations to determine if the Iraqi Regime was using thrust augmentation to boost the range of these missiles in contravention of the treaty provisions that ended the 1991 Gulf War. PSI received a best paper award from the JANAF Joint Propulsion Conference for its work in this field. The use of the AIRIS technology for chemical vapor detection was quickly oriented towards chemical and biological defense through funding by the Army Edgewood Chemical Biological Center as well as the Defense Threat Reduction Agency. The technology quickly advanced through two stages of prototypes which were extensively tested on ground, vehicle and airborne platforms at test ranges such as Dugway Proving Grounds, DSTL Porton Down (UK), NSWC Dahlgren, and the Redstone Technical Test Center. From 2009 to 2011 Smiths Detection and PSI partnered to advance the technology as a candidate for the Next Generation Chemical Standoff Detector, culminating in the award in 2011 of and Army SBIR Achievement Award. AIRIS development effort also sparked the initiation of several algorithm development activities. PSI successfully implemented the Adaptive Cosine Estimator (ACE) algorithm for chemical cloud detection in the LWIR to provide the first real-time detection capability for these clouds that did not require prior background determination. In the Range Test Validation Program PSI used a constellation of five AIRIS sensors, operating on a 6 km diameter arc, to provide real-time 3-D vapor cloud concentrations within a 1 km x 1 km grid using Computed Tomography. Our work in the extraction of small signals in cluttered background for chemical vapor detection led directly to our growing business in standoff radiological and nuclear materials detection. Our work with AIRIS in liquid and solid chemical agent detection on surfaces has been adapted to the detection of trace explosives on surfaces. 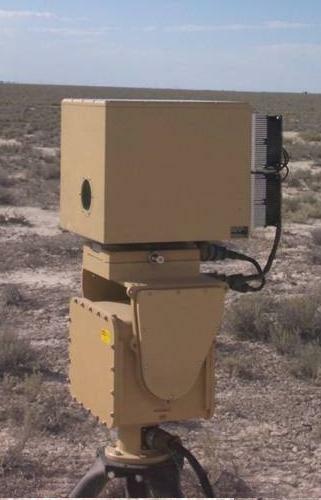 Through funding from the Army, the Army SBIR Commercialization Pilot Program, and the DARPA Adaptive Execution Office we developed detection algorithms as well as novel illumination sources to enable all-weather standoff detection capability for a range of explosive materials and their precursors.